Doctor Terrence Philmore (aka Doctor Love) may be an unprofessional, womanizing, love machine, but my word does he get results! Click here to play! Unfortunately for Doctor Love, his hospital is critically understaffed and there is an overabundance of sick and injured patients. Help put that blinding smile back on the Doctor's face by landing winning combinations and taking home exorbitant amounts of cash! Test yourself on the Love Meter symbol, and if you can get 3, 4 or 5 to display in one spin you will be rewarded with 10, 15, or 20 free spins, respectively. Doctor Love is also Wild � in every sense of the word � and if you can land five of him at once (oh my!) you will be paid out 5000 times your initial bet. So it's time to pull on the gloves and load up the slots because Doctor Love is in the house, and he's got a whole love of money to give away. The Love Meter is Doctor Love's Scatter symbol. Depending on how many you display after each spin will deteremine how many free spins you will receive. 3 = 10 free spins, 4 = 15 free spins, 5 = 20 free spins. Scatter symbols also pay out on initial bets when 2 or more appear at once. 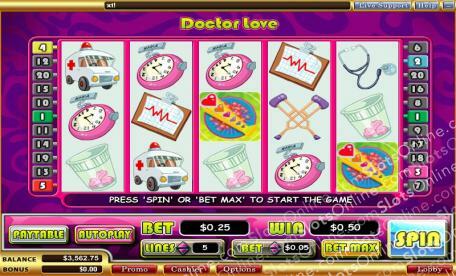 Doctor Love himself is the Wild symbol and he will pay out on wagers whenever he appears. If 5 of him show up on one spin he will pay you 5000 times your stake.